Sometime in the Neolithic period – the Late Stone Age – people came to live on the island of Crete in the Mediterranean Sea. Nobody knows for sure where these people came from. It might be West Asia, or it might be Greece, or it might even be Egypt. Up until the Middle Bronze Age, the Cretans (KREE-tans) were doing about the same as the pre-Greek Lerna people on the mainland were doing. But when the Indo-Europeans (Yamnaya) invaded Greece about 2100 BC, they didn’t know how to sail boats. So they didn’t reach Crete. The Cretans, also called the Minoans, just kept on building up their civilization. They made better and better pottery and stone vases and houses. They ate a lot of figs and olives, fish and wine. The Cretans also grew opium and used it for medicine and as part of their religion. By about 2000 BC, the Cretans were making money by working as soldiers for the Egyptians, and as artists painting Egyptian palaces. They used this money to build big palaces all over their island. These palaces had many small rooms around courtyards. The courtyards let in the light and gave them cool places to sit (Crete gets VERY hot in the summer!). In 1700 BC, a terrible earthquake shook the island of Crete. All the palaces were destroyed. But the Cretans quickly rebuilt even bigger and better palaces over the top of the old ones. Knossos (kuh-NOH-soss) is the biggest of these palaces. Knossos has hundreds of rooms. Many of the rooms are brightly painted with pictures showing plants and animals and people in fancy clothes dancing or talking. There are also some nice things like bathtubs and toilets with running water. (But they were only for the queen and king). The Cretans by now were so much stronger and richer than their Mycenaean Greek neighbors that they seem to have pretty much been able to tell the Mycenaeans what to do. Greek myths like the stories of Daedalus and Theseus make us think that the Cretans even took Greek people back to Crete with them to be their slaves. About 1620 BC a huge volcano erupted on the island of Thera, near Crete. The town of Akrotiri, on Thera, was completely buried by the mud of the volcano. Nobody could live there anymore. Maybe the ashes from the volcano also were bad for Crete, but they can’t have been too bad. The Cretans went right on living in their palaces and stomping all over the Greeks and working for the Egyptians. These palaces seem to have done very well until about 1450 BC. But then fires destroyed all the palaces except Knossos. Then about fifty years later, Knossos also was destroyed. This time, none of the palaces were rebuilt, and Crete became a much poorer place. Nobody knows for sure who burned the palaces, but it was probably the Mycenaeans. They had finally gotten strong enough to push the Cretans around instead of the Cretans pushing them around. The Minoans, by Don Nardo (2004). For teenagers. The Archaeology of Minoan Crete, by Reynold Higgins and Rosemonde Nairac (1973). Out of date, but Higgins is an expert on the Minoans, and this book is specially written very simply. The Archaeology of Greece: An Introduction, by William Biers (revised edition 1996)Biers writes very clearly and has a lot of good pictures. 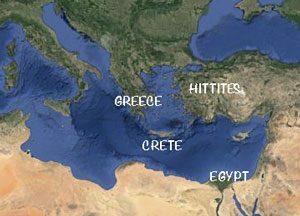 He does include Crete. 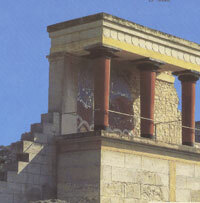 Minoans: Life in Bronze Age Crete, by Rodney Castleden (reprinted 1993). Castleden may exaggerate the opium use and darker sacrificial tendencies of the Minoans, but it’s clear there was at least SOME opium use, and his account is more balanced than some rosier ones. Cite this page: Carr, K.E. 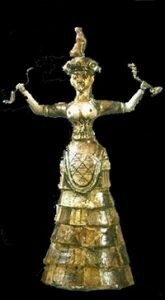 Minoan Crete – Bronze Age Greece. Quatr.us Study Guides, July 7, 2017. Web. April 19, 2019.